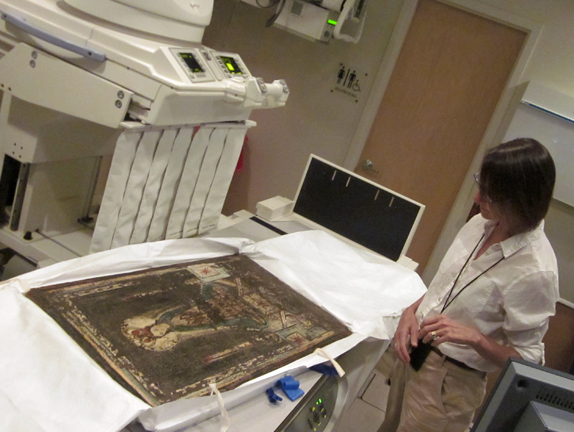 We told you recently about the Conservation Lab’s investigation into the probable painting-behind-a-painting of Nuestra Señora de San Juan de los Lagos (Our Lady of Saint John of the Lakes). Today, the painting took a trip to Albuquerque, where a friendly radiologist and his staff put her under their high-tech equipment for a look more intense than Museums of New Mexico equipment allows. Dr. Jim Lowry (at left, with radiographer Cassie Barth) at El Camino Imaging Center invited Museum Resoures Division Conservator Mina Thompson and History Museum curator Josef Diaz to bring the painting in after another physician relayed our suspicions and limitations to him. He volunteered the use of his center’s equipment and staff, intrigued as we were at this unusual juncture of art, history and science. 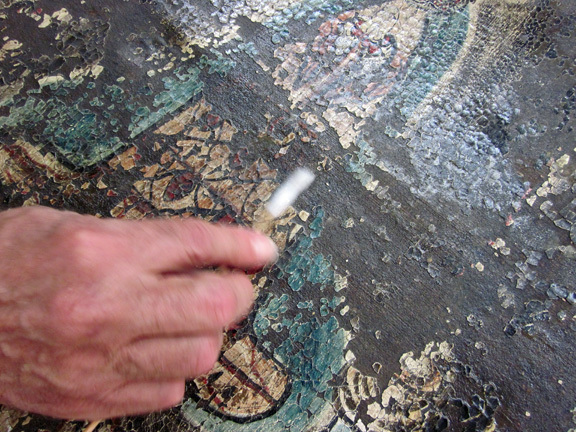 Here’s the painting’s story, in a nutshell: Contract conservator Steven Prins had uncovered some evidence of an earlier painting beneath the ca. 1820 image painted by José Aragón while cleaning the waxy, sooty, flaked and cracked canvas. Thompson, the lead conservator in the investigation, aimed the Conservation Lab’s best equipment at it and found some evidence that indicated there were indeed two layers of paint containing different minerals — one sign that the paintings were done in different eras. The painting comes from the New Mexico History Museum’s Larry Frank Collection, which includes numerous examples of Aragón’s bultos and retablos. Paintings on canvas were rare in his 1820-1850 creative arc, because the medium was difficult to obtain in northern New Mexico’s frontier conditions. One theory holds that the initial painting came up El Camino Real and hung in a church or home where it suffered some kind of damage. At that point, Aragón may have been hired to re-create the image or develop a new one — an option he likely would have jumped at just for the chance to try something new. 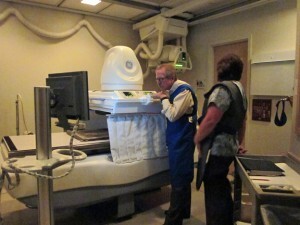 At the imaging center, Lowry, Barth and lab manager Beth Rocco put the painting through a series of X-ray workouts of various intensities, each time crowding around computer screens to see what might be revealed. Early on, a ghostly image raised a flutter of intrigue: What appeared to be three lines of a signature or inscription glowed on the screen, tantalizingly. 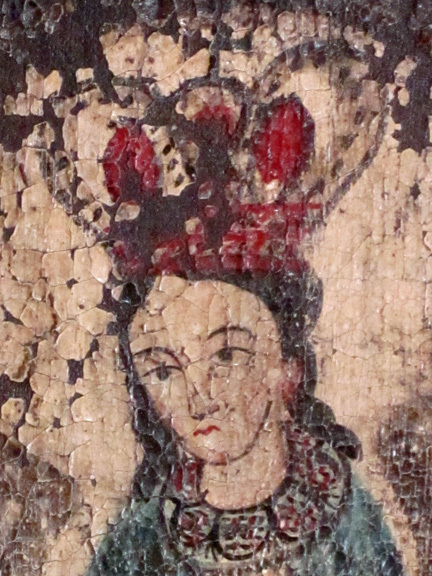 A different intensity of image, though, showed the lines to be part of the crown that Our Lady wears in the visible part of the painting, with the X-ray machine picking up on the lead or mercury contained in the red paint. 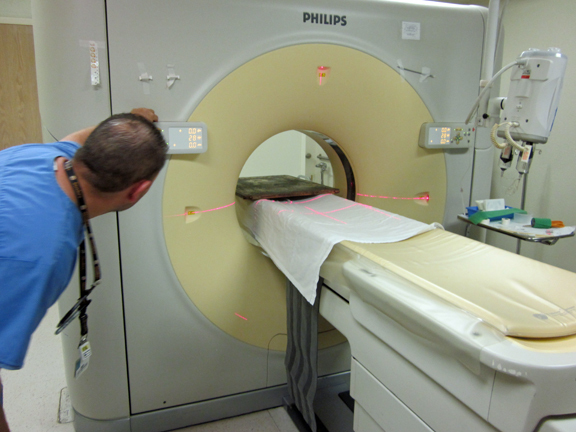 As further images failed to produce anything more conclusive than some curious dots, the technician who runs the center’s CT scan offered to put the painting into its tube during a rare 10-minute break in his patient schedule. With that test, we could photograph thin-as-skin layers of the painting, which we hoped would give us a better idea of what lies beneath. The effort became something of a group exercise at El Camino Imaging, with various physicians and technicians weighing in with their suggestions. Lowry admitted that he had spent some time on Google looking for other examples of X-ray paintings. We extend our deepest gratitude to Dr. Jim Lowry, Cassie Barth, Beth Rocco, and all the other staff members who helped make today possible. In addition, we’d like to thank Dr. Margaret Chaffey and Dr. Malcolm Purdy. She doesn’t speak very often, so we can’t ssay for certain, but we’re pretty sure Our Lady had a good time, too. Conservator Steven Prins (left) inspects "Our Lady of the Lakes" with curator Josef Diaz. Could another painting be lurking beneath the cracked surface of Nuestra Señora de San Juan de los Lagos (Our Lady of Saint John of the Lakes)? 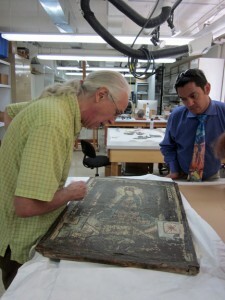 Conservator Steven Prins carried that question to the Conservation Laboratory of the Museums of New Mexico this week, hoping that some high-tech equipment and the help of the museums’ conservators might lead to answers. The painting comes from the New Mexico History Museum’s Larry Frank Collection and was likely created around 1840 by José Aragón, a master santero whose bultos and retablos are on display in the museum’s Tesoros de Devoción exhibition. Josef Diaz, curator of Southwest and Mexican Colonial Collections, hopes to include it in a 2014 exhibition, Painting the Divine: Images of Mary in the New World. First, though, he needed to see what it would take to clean it and preserve it, so brought in Prins to have a look. The painting’s surface, waxy and coated with soot, has cracked and flaked to the point its underskin peeks out — something that tantalized Prins, who thought he spied the hand of another artist beneath Aragón’s. He did a bit of spot-cleaning with a cotton swab and mineral spirits, and a faint hint of black lines and red spaces appeared. 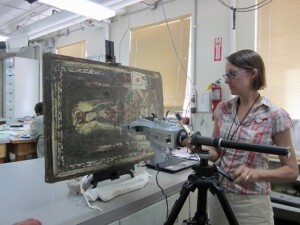 On Monday, Aug. 6, Prins and the painting came to the Conservation Lab, where Associate Conservator Mina Thompson aimed some high-tech devices at its surface in hopes of uncovering more information. Diaz suspects that an underlying painting — if it exists — was created in Mexico and brought to Santa Fe where it suffered some type of damage, most likely drips from one of our notoriously leaky flat roofs. Aragón may have been eager to try his hand at the canvas medium or may have simply accommodated the owners’ request that he repaint the original image or create a new one. Thompson brought out two pieces of equipment: MuSIS, a multi-spectral imaging tool that interprets artifacts in different wavelength bands, from ultraviolet to infrared, in effect “seeing” it in layers; and the lab’s trusty pXRF, an X-ray fluorescence machine that can detect elements heavier than silicon in the periodic table. By comparing the machines’ results with those obtained from other artifacts, conservators can make reasonably solid assumptions about how things were made, with what materials and, sometimes, in what time period. They took a series of images, double-checking them on a laptop screen as they went, trying to determine whether a shadow here meant X and a brightness there meant Y. Their best immediate results came when the pXRF was used to test the color red in different parts of the painting — the suspected “old” painting and Aragón’s. 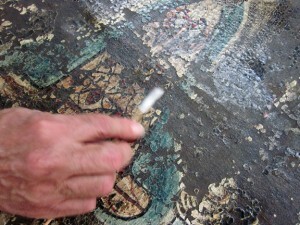 The patch of older paint proved to contain lead while the newer part showed mercury. That supports a hypothesis that the two were painted by different people, possibly in different eras, and maybe as many as 100 years apart. But, Thompson said, “We have a lot more work to do.” They need to analyze more areas and compare the machines’ results with tests from other objects for further confirmation and they hope to take a leap into even more precise testing tools. Technological advances tend to roll faster than most museum systems’ abilities to keep up, so equipment more wiz-bang than the Conservation Lab’s capabilities are needed to firm up our knowledge of Our Lady. Now that they know the painting’s likely holding onto a secret, Thompson, Diaz, and Prins are hoping to take it to a medical facility’s imaging technology as a next step. The goal is to know more of the painting’s story; no one expects to find a masterpiece so fine that it’s worth removing the Aragón painting to reveal it. Diaz is particularly impressed with the fine details and gracefully simple expression that Aragón achieved on Mary’s face. Prins is impressed with Aragón himself.